45 mm microblasted and polished black ceramic case, microblasted and polished black ceramic bezel with 6 h-shaped titanium screws and black composite resin lower, sapphire crystal with anti-reflective treatment, sapphire dial, HUB 1270 self-winding perpetual calendar and chronograph movement, approximately 72 hours of power reserve, black lined rubber strap, black-plated titanium deployant buckle. 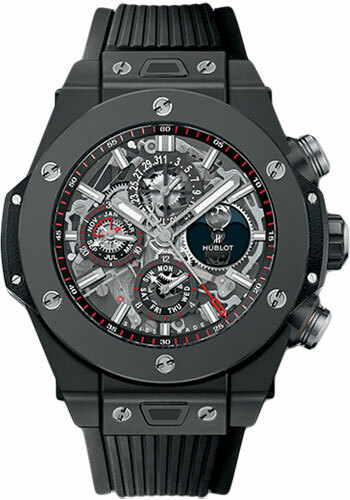 Water resistant to 100 m.
45 mm microblasted black ceramic case, microblasted black ceramic bezel, sapphire crystal with anti-reflective treatment, mat black skeleton dial, HUB 1242 self-winding movement with flyback chronograph and column wheel, approximately 72 hours of power reserve, black microblasted ceramic bracelet, black-plated titanium deployant buckle. Water resistant to 100 m.